Andrew Carmellini, in his new book American Flavor, shares a biscuit recipe that he calls “the world’s best biscuits.” This is a bold claim, even for a chef as revered as Carmellini, but in his defense, when he started serving biscuits (and fried chicken) at his pre-The Dutch Italian restaurant, Locanda Verde, the critics gushed. In fact, while working on a different book proposal, I called Carmellini to have him coach me through biscuit-making on the phone. The man knew his stuff. But the man, at the time, wouldn’t share the exact recipe because–as it’s now clear–he was saving it for his book. Now, to our immense relief, the book’s out and so’s the recipe. Serious Eats got there first, and here I am following suit. The biscuits, which I’m calling “Honey Butter Biscuits,” don’t have any butter in them–the butter mixture gets slathered on at the end. Then you add buttermilk, work it around and knead it into a dough. Now some biscuits, like my go-to recipe, don’t have you work the dough much. 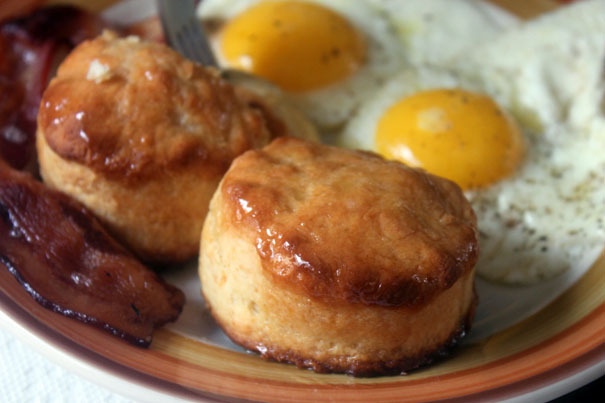 You just add that buttermilk, scoop the biscuits into a baking pan, brush them with butter and bake. 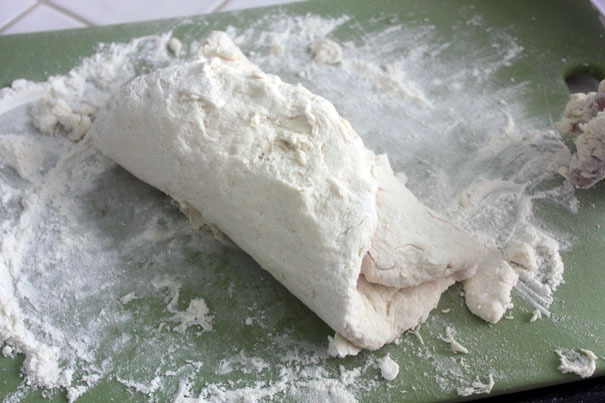 If that looks difficult, it’s really not–though it helps if you have a bench scraper (for when the dough sticks) and if you’re liberal with the flour to solve that very problem. You probably won’t be shocked to hear that these biscuits were pretty divine. And, because of all that folding and the shortening, flakier and more bread-like than the cake-like drop biscuits I’m used to making. My main complaint, though, is that because these biscuits are made with shortening, you don’t get the wonderful butter flavor that you get from butter-based biscuits. 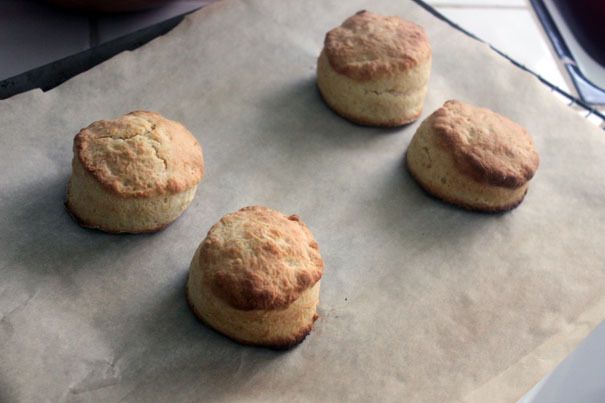 Sure, butter is brushed on at the end, but I like butter in my biscuits–which is why my go-to biscuit recipe will remain my go-to biscuit recipe. Still, if you’re cooking for Southerners (who’ll appreciate the authenticity here) or you want to try something different, these biscuits certainly won’t disappoint. I froze half of the uncooked biscuits and we’ll be eating them again this weekend. I’m not complaining. 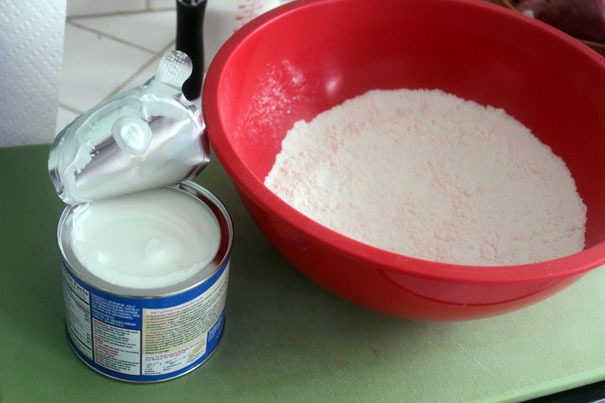 Preheat the oven to 425 and, with a whisk, combine all of the dry ingredients in a large bowl. 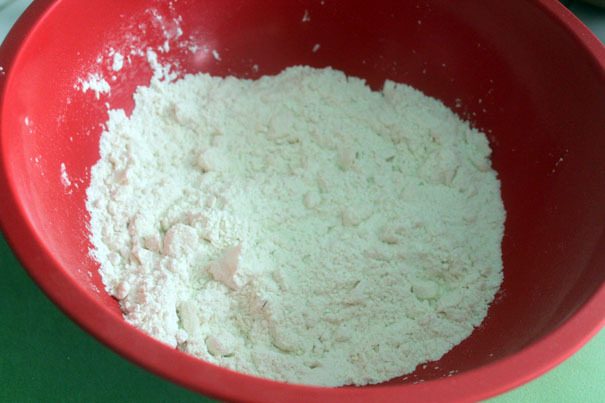 Add the vegetable shortening and with two knives slash across the bowl, cutting the fat into the flour mixture, until it resembles coarse meal with a few large lumps here and there. Add the buttermilk and stir lightly with a rubber spatula just until it comes together. 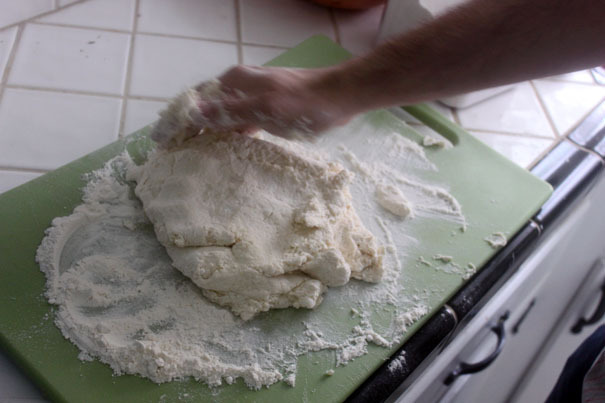 Then, with floured hands, begin kneading the dough until it comes together into a ball. 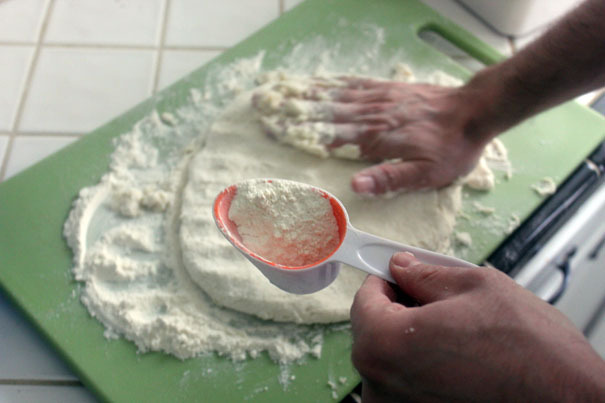 Transfer to a floured surface and knead a little bit more. Now flatten the dough (you can use a rolling pin, but I just used floured hands) until it’s 1/2 an inch thick. Fold it like a business letter (see above photo), slap it down really hard to bring it back together, flatten it to 1/2 an inch thickness and do the business letter thing again. Repeat 7 times in all, skipping the folding the 7th time. 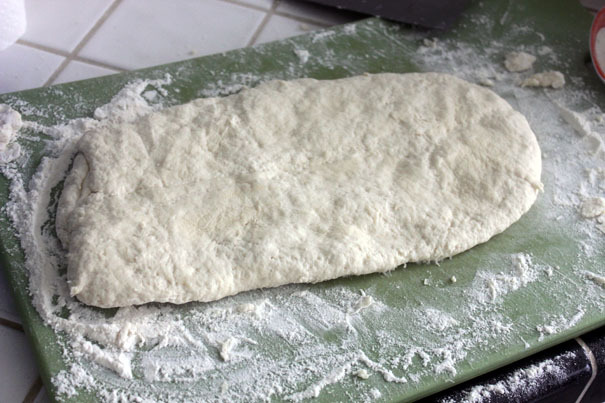 Flatten the dough to 1/2 an inch thick. 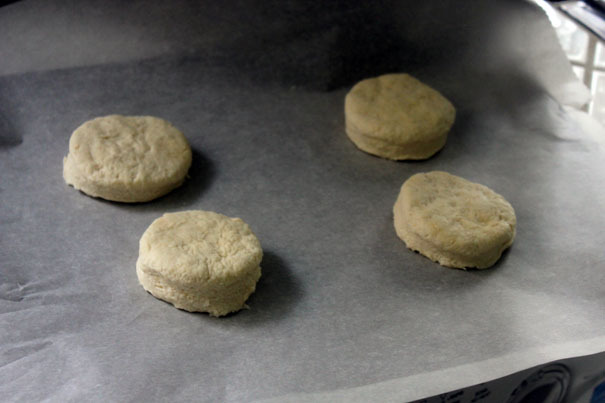 Use a floured biscuit cutter or a cookie cutter (about 3 1/2 inches wide) to cut out biscuits. Place them on a parchment-lined cookie sheet, as many as you want to eat (you can freeze the rest on a cookie sheet and store them in a freezer bag) and bake for 20 minutes until the biscuits are golden brown. 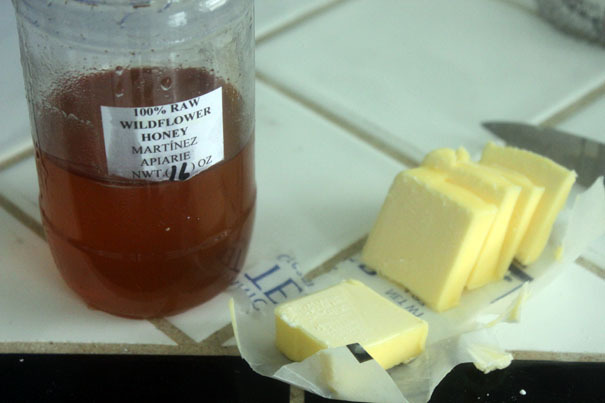 While they’re baking, make the honey butter mixture. Bring two tablespoons of water to a boil in a small pot. 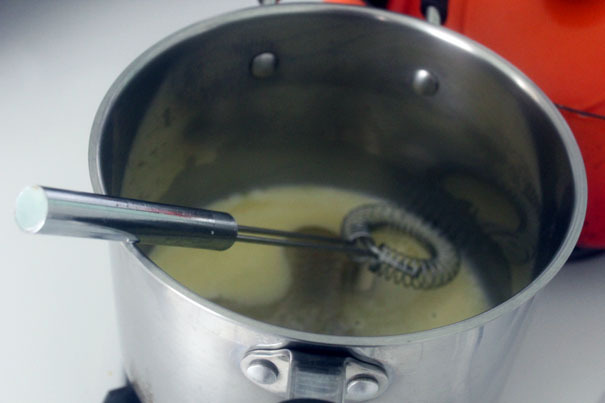 Slowly whisk in the butter, piece by piece, letting each piece melt before adding the next one. Add the honey and salt and whisk until you have a shiny, well-combined liquid. 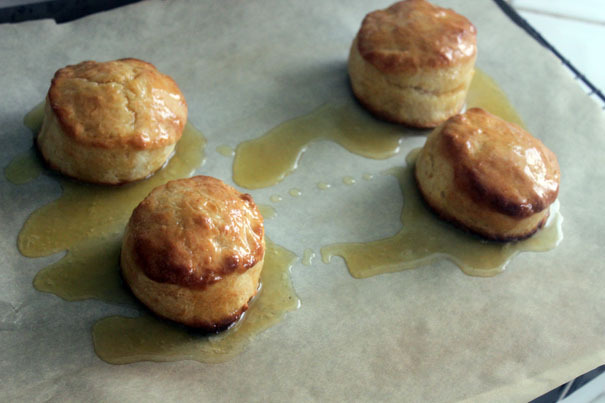 When the biscuits come out of the oven, brush them with the honey butter (or just pour the honey butter on top). Serve right away with more butter and honey because why the heck not. Makes about 8 to 10 biscuits.